Sparkling performances of two Mozart gems by one of his foremost 20th century interpreters, in the best possible sound. Mozart: Piano Concertos: No. 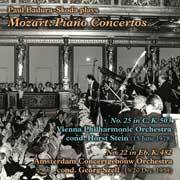 25 in C, K503, with Horst Stein conducting the Vienna Philharmonic Orchestra (performed live 15 June 1978) and No. 22 in Eb, K482, with George Szell conducting the Amsterdam Concertgebouw Orchestra (performed live 19 & 20 Dec. 1959). K503: first release; K482: first time on CD. Extensive notes on the music and on these performances by Badura-Skoda. Booklet includes his CD discography.